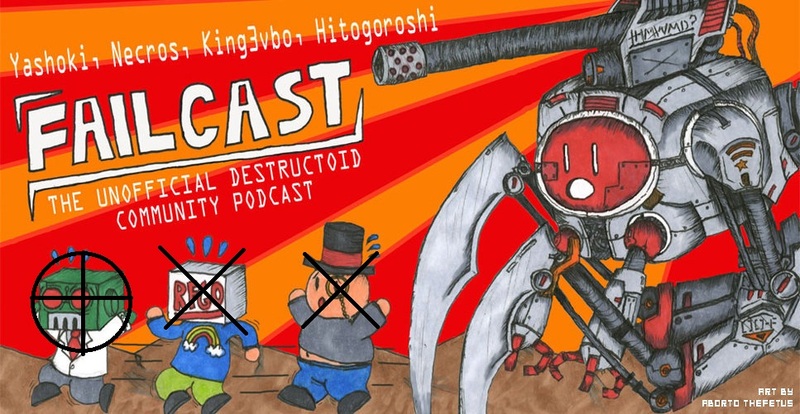 Failcast rebounds from our horrible failure last week with episode 28, recorded on up to 28 different machines at once to guarantee that we captured every horrible moment. As usual, Yashoki hosts our episode, joined by King3vbo and Necros. Charlie couldn't make the show, so Failcast alum CountingConflict jumped at the chance to sub in for him. And our community guest? The radical communist Professor Pew who terrifies us with his vague foreign accent, bizarre words, and attacks on our personal values of liberty, freedom, and democracy. The main topic at hand on tonight's show is the recent discussion over Jim Sterling's Halo Wars review, since we recorded before Sterling decided to edit and republish the review. Also included for your listening pleasure is a random discussion we had during a break concerning survival horror games that was just too good not to include - feel free to offer your opinions in the comments, if you care. And as always, you can reach us at [email protected] if you are interested in being a community guest on the show. 39:00 - Continuing, how do you make suspense in video games? 77:00 - "I hate that about any show, when some girl won't put out"
Download or I'll fill her head full of lead! Don't test me, I'll do it!